One of the more common butterflies seen in Florida is the gulf fritillary. This is one of the longwing butterflies (Heliconiini tribe), a subgroup of the brush-footed butterfly family (Nymphalidae). Other longwings found in Florida include the state butterfly the zebra longwing and the Julia butterfly, found only in the southern part of the state. The adult butterfly is mostly brownish-orange with black markings on the upperside. There are three white spots surrounded by black near the leading edge of the forewing from about the midpoint towards the base. The undersides of the wings are lighter, with the hindwings and tips of the forewings covered with silvery spots. Females are larger and paler than the males. All of the longwings utilize passionflower vines exclusively for caterpillar host plants. There are about a dozen species of Passiflora found in Florida, half of them native. One of the most common is the Purple Passionflower, Passiflora incarnata. This gulf fritillary butterfly is nectaring on a white passionflower, a naturally occurring white form of Passiflora incarnata. The adult butterflies will feed on a variety of wildflowers, such as the tall elephantsfoot (Elephantopus elatus) in the photos above, the pollinator popular Spanish needles (Bidens alba), and many others. The caterpillar is orange with rows of black spines. A patch of corkystem passionflower in our yard has become a little gulf fritillary nursery the past few years. At the end of the larval stage, the caterpillar will attach the tail end somewhere, typically the stem of a passionflower vine, and begin the metamorphosis into the pupal stage forming a chrysalis. The series of photos above shows: (1) the caterpillar just forming into the chrysalis, (2) a typical chrysalis during most of the about 11 day pupal stage and (3) about an hour before the butterfly emerged. This video clip made from a series of photographs shows the newly emerged butterfly hanging on the exuvia (empty shell of the chrysalis) and performing the necessary unrolling and rolling of the proboscis to form the two halves together. A gulf fritillary butterfly nectaring on Feay's Prairieclover. Note that it appears that the butterfly only has four legs. The two front legs are greatly reduced and held up against the body. They are covered with hairs, giving them the family name brush-footed butterflies, that act as sensory organs. 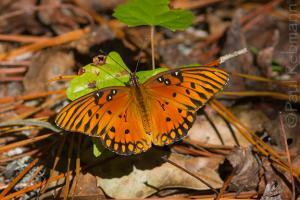 For more information about and photographs of gulf fritillaries, visit Wild Florida Photo.